The fold up wagon is a perennial favorite among regular car campers. If you are a newcomer, it might not be something you may have used before or an obvious purchase. Folding wagons are indispensable for carrying heavy gear across all kinds of terrain. Not only are they useful for transporting your camping gear – they can also help you carry pets or kids. 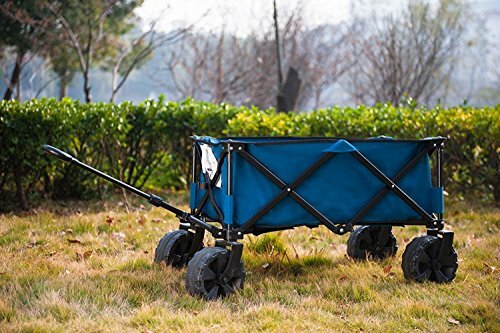 Given this fact, it’s important that when you are looking for the best folding wagon for your next camping trip, you need to focus on the most important aspects of its design such as sturdy construction and quality of materials. 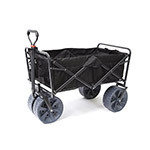 A collapsible folding wagon needs to be easy to setup and put back down again when not in use. Furthermore what’s the size of the cart once folded down. Better models will be more compact and take up less space in the trunk of your car. If you’re taking your wagon to the beach then chances are you’ll only be dragging towels, sunscreen and snacks. If you’re using it in the garden or to take shopping then you’ll need something that can take a bit of rough and tumble. The material which forms the basis of the storage will need to be durable if coming into contact with tools and groceries. Some carts are easier to use than others. Three wheeled models specifically might take some getting used to. If you’re using the wagon over rough terrain then a four wheeled option might be better. The height of the cart, or the depth of the storage area will affect stability. So choose wisely based on your intended use. If the cargo is precious then a more stable, low to the floor cart will be the order of the day. With this in mind, let’s take a look at some of the most popular folding wagons on the market. We’ve taken three of the best selling wagons in the country and put them through their paces. So, read on to find out more and discover the results. The Coleman Camp Wagon is a mid-priced model that is highly popular with the camping and outdoor activity communities. It has a range of excellent features, including a robust polyester bin and swivel frame for use on rugged terrain, and a telescoping handle for easy handling. 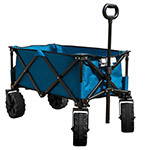 There are also swivel-front wheels to ensure your wagon doesn’t get stuck in uneven surfaces, and it is constructed in an accordion style design so you can fold up and carry when not in use. 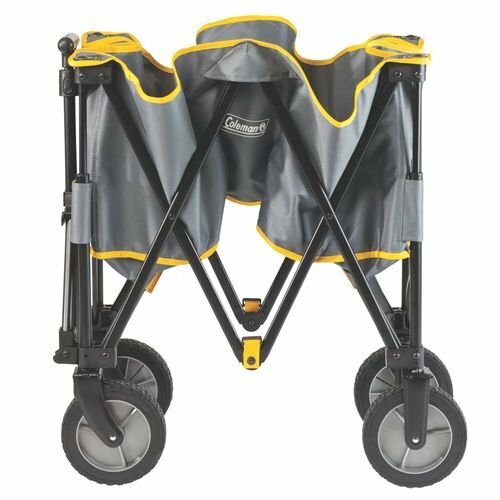 The Coleman Camp Wagon is an excellent little product that is easy to set up, great to look at, and offers a smooth ride across even the toughest of surfaces. 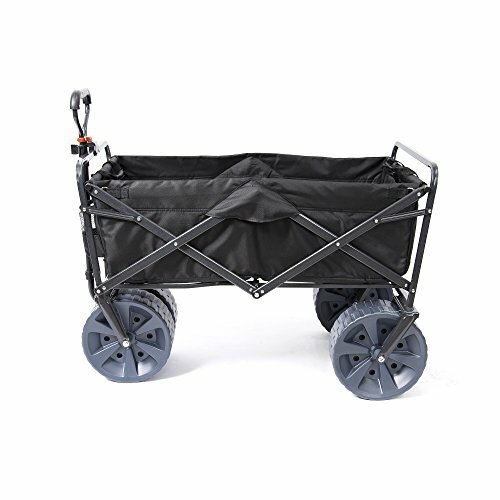 It’s a little bigger than the average folding wagon, so could come in handy when it comes to pulling lots of camping gear – and when your kids get tired walking back from the beach. However, the frame is actually a lot heavier than you might expect from a highly portable wagon. Once you load up your camping gear, pets, or even your children, you will need a reasonable amount of strength to get over even smooth terrain, let alone the rugged landscapes you find on camping trips. And, it’s also important to point out that the cover can get very tight, very quickly. Still, it’s sturdy, well-made, and at a good price point which will attract those on a budget. The Coleman Camp Wagon is a great little product – if you have space for storage and can handle the reasonable weight. While camping enthusiasts will enjoy the rugged nature of the equipment, its size, and weight might be an issue. That said, for a multi-functional folding wagon that you can use in everyday life as well as on camping trips, it’s reasonable value and worth a look. TimberRidge’s offering takes things up a level for the serious camping enthusiast. It’s a bit of a beast, with big dimensions in all directions and a gorgeous steel frame that screams durability. Pride of place, however, are the 8-inch diameter wheels – the front two of which are rotatable. Finally, the TimberRIdge can be folded up to the size of a carry bag when not in use. So, what’s the news about this little folding wagon from TimberRidge? Well, first and foremost, it’s a large, durable affair that you can pack a lot of stuff into. And once you fold it down, it takes up very little space, so ideal for transporting in the car before your camping trip. Next, let’s get stuck into these impressive wheels. As you can imagine, you can rocket around at speed on hard, flat surfaces, but the 8-inch wheels are also good enough to handle the tougher terrain. You can get through sand, too, although in reality, it is always going to be tough when the beach surface is deep and soft. If you do plan on taking it to a beach regularly with soft sand, consider getting different wheels -there are inflatable alternatives that will work much better than the standard, plastic-molded set. Overall, the TimberRidge wagon is a good, solid folding wagon that will do the job for anyone of below average height. But the small arm is a game changer and is likely to make this option a no-go for anyone who is of reasonable height. Finally, let’s take a look at the Mac Sports All Terrain Utility Wagon. Features include a super durable frame, tough fabric, and compact folding. There’s an adjustable handle, too, and it’s also worth noting that the Mac Sports Wagon has a pair of drinks holders located by the handle. But how does it stack up? Let’s take a look. 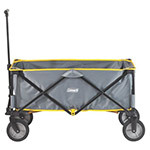 The Mac Sports Folding Utility Wagon is an impressive piece of kit. The fabric covering and metal frame are incredibly durable, and perfect for those long treks while on a camping trip. You can pull up to 100 pounds of cargo with relative ease across all kinds of surfaces, and it should be a while before you start to see any signs of wear and tear at all. Beyond the central holding area, one feature really stands out – the wheels. They are lovely and wide, which prevents you from getting stuck in ruts, or clogged in soft sand. However, one thing about the Mac Sports option is that there is something of a learning curve involved. We managed to tip over the wagon a few times when we were first getting started with it, and to be honest it was a bit of a worry. The good news is that if you persist and get to know the cart, it will reward you. Another issue is that the wagon has a slight habit of tipping when carrying heavy loads – and you will also experience this when you stack your gear up over a couple of feet of the top of the wagon. It’s an annoying issue in an otherwise exemplary piece of kit. That said, the Mac Sports utility wagon folds up exceptionally well, and it’s a remarkable feat given the sheer size of the wheels – it really benefits from the unique design of the front wheels which allows you to slot everything into place once folded. Finally, the addition of two cup holders is a fantastic one, particularly if you have ever experienced that extreme thirst you can sometimes get while dragging your gear from car to site or on a long hike. While the learning curve for using is steep and the tipping issue is something to look out for, the reality is that the Mac Sports is an excellent wagon and offers exceptional value. It’s durable, versatile, and can get you over all kinds of terrain. This particular model even makes it to our recommended gift list for campers. Just make sure that you keep your loads around the recommended weight mark, or you might end up tipping your gear everywhere. 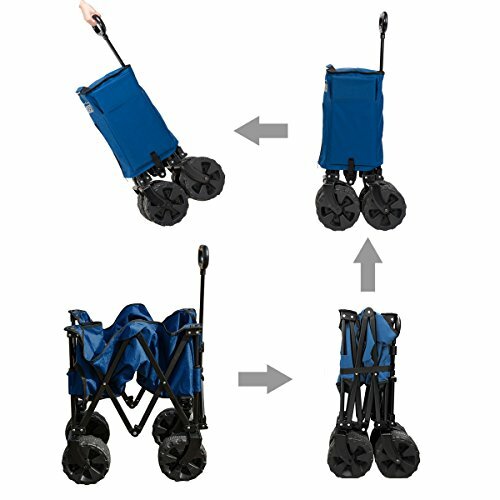 The Verdict: Which Collapsible Folding Wagon Would We Purchase? So, who picks up the title for our favorite folding wagon? Without a doubt, that honor has to go to the Mac Sports All Terrain Utility Wagon. 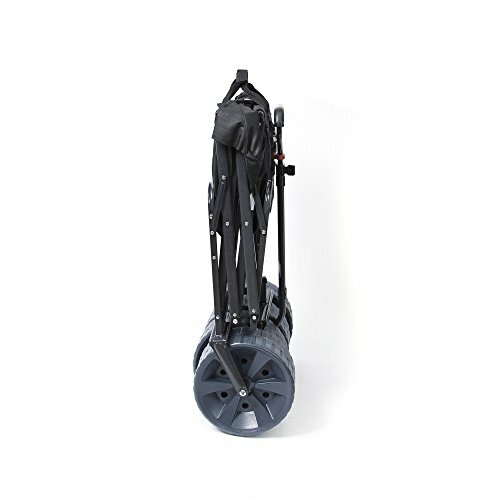 It’s an exceptional heavy duty folding cart that, despite its minor problems, is streets ahead of the other competitors. It’s good value, too, and perfect for any camping enthusiast – and many others. And the runner up position? We’re going to award that to the Coleman Folding Wagon for its excellent value and portability. Unfortunately for TimberRidge, the short handle issue on their wagon is just too much of an issue to recommend, although if you are of a small stature, there is enough to enjoy.